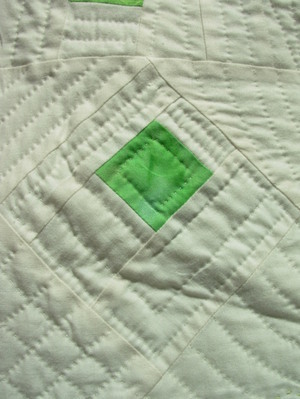 Thank you for the lovely comments on my Think Green quilt. I've been working on some other small quilts and have even opened an Etsy shop in the hopes that I may one day actually sell something I make. This is a scary proposition, but I'm excited too. Chloe helped me set up my shop and set one up for herself at the same time. So far, we don't have any items listed, but I do have a first item in mind. 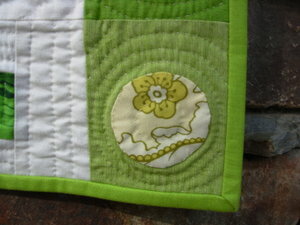 It's this little quilt which I put together with leftovers from a baby quilt I've been working on. These aren't the colors I normally work with, but I still think it's sweet. 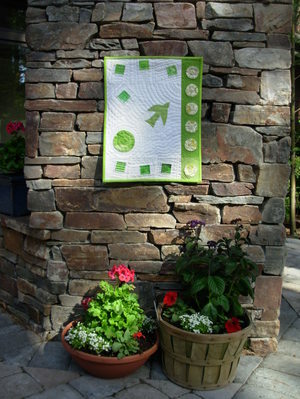 This little quilt is an original design, is about 12" x 12" and is machine pieced, hand appliqued, hand embroidered and hand quilted. Once I get shipping charges figured out, I will be listing it. Wish me luck! 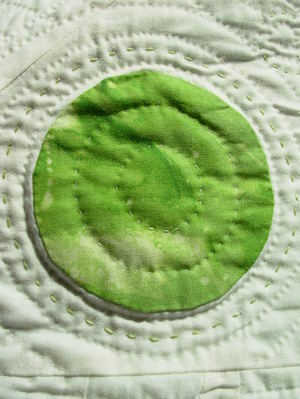 With 6 of these baby quilts to do, I'm starting to get a bit more adventurous with the quilting. 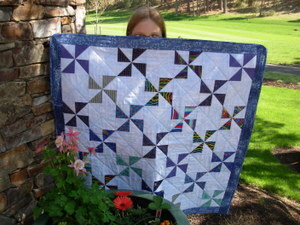 This is the finished pinwheel quilt. 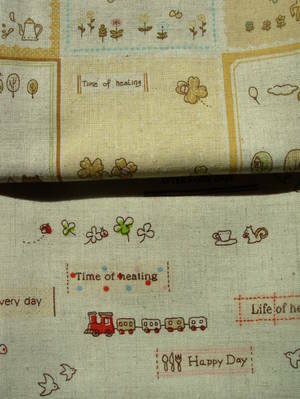 I really like the border fabrics. 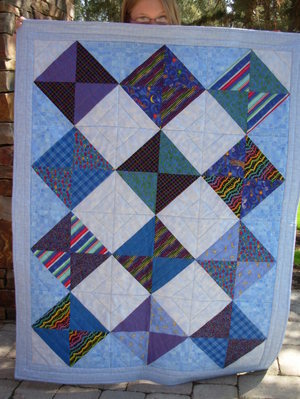 Here's the other baby boy quilt. These two are for my cousin's twin boys born in January. They live in Australia so I may never see these quilts in action, but I like that they are complementary, but not identical. 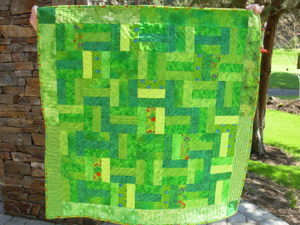 And here is the quilt that makes me so happy! 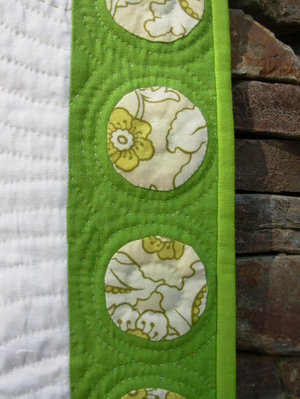 I love this one because it's the first one that I've free-motion quilted and actually liked the results. I'm keeping this one for myself! Last weekend I spent a couple of hours doing something I'd put off for a long time. I knew it was inevitable, but it was difficult. This is the most knitting I've ever had to rip. This is Noro Silk Garden. For the last 6 months I'd work on this sweater sporadically (though it was started 2 years ago), but I knew for quite some time that it wasn't working. The colors are amazing, but the yarn was too drapey and the garter stitch band, which is knit first, was too sloppy. 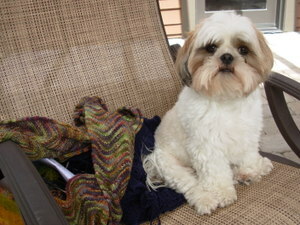 Last month, I finally fell under the spell of Argosy from Knitty. I first heard about this from Kay (March 19 post- go take a look at it- it's gorgeous!) 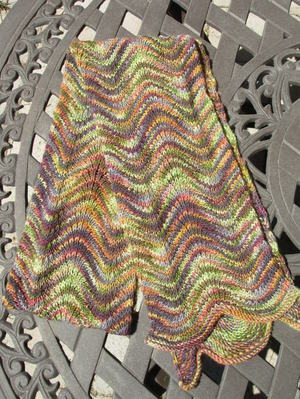 on Mason-Dixon Knitting and one night as I was falling asleep I decided what I really needed was a wrap pattern similar to Clapotis, but without the dropped stitches, which were the most difficult thing about my Silk Garden Clapotis. 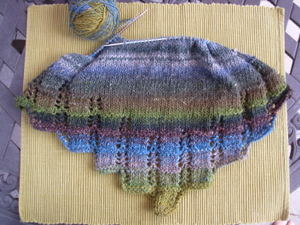 So, last week I started the Argosy Wrap with some of the extra silk garden from the sweater to make sure I liked it. It is a very satisfying knit and I'm starting to get the hang of the pattern. I'm now in the middle section and it's going very well. On Sunday I took the plunge and ripped and now it looks like this. Sunday and Monday were spent sewing til my back was aching, but I did get a lot done. 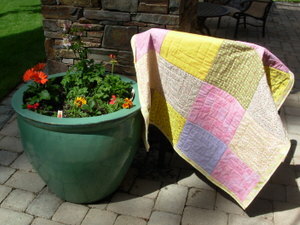 I need to get some more photos, but here are three of the quilts that I worked on. 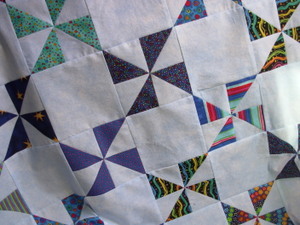 This pinwheel quilt is the one that I was really dragging my feet on. All those triangles and the 8 point center were very offputting and I wasn't that crazy about the colors at first, but I have to say I'm liking it more and more. 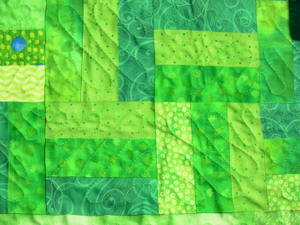 Now it has a nice border and is all quilted. Finished photo to come soon. 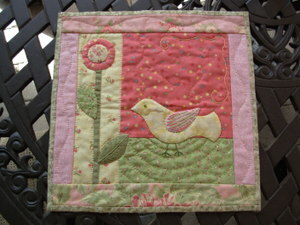 This little sweetie is a quick quilt I made for my quilt guild's community quilt program. 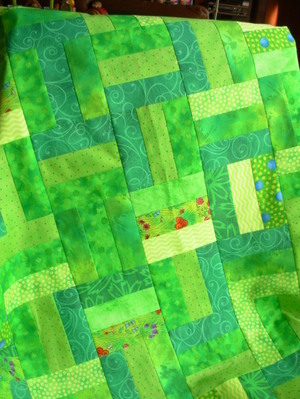 I like the quilted squares, though they were a bit of a pain to do. 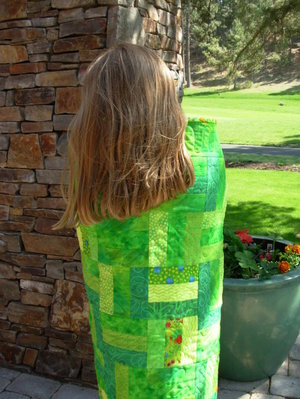 Funny, when I was reading Happythings last night she has a quilt she just finished using the same quilting technique! 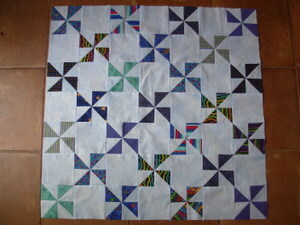 In this photo the quilt has the binding sewn to the front, but hasn't been hand sewn to the back yet. Finally, here's my favorite. I'm not sure what I'll do with this one. 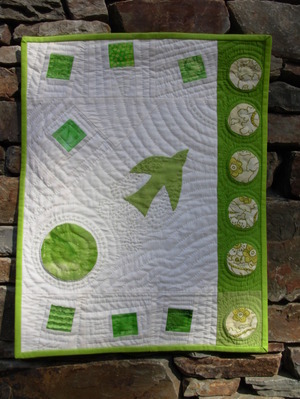 I thought at first it was a quick community quilt and I used all my green scraps to make it, but I really love it and may end up keeping it for myself. While I was doing all this sewing I had a marathon of another sort. I re-watched my video copies of the Anne of Green Gables miniseries. This was 9 hours of viewing pleasure and Ryan watched most of it with me. I wasn't expecting him to get so into it. 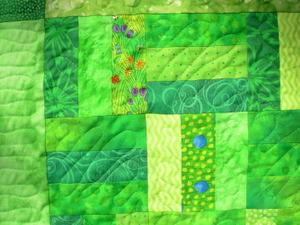 Today got back to normal with all the regular activities and I didn't get to do any quilting. It was our first day in the 80's though, coming after snow flurries last Wednesday! 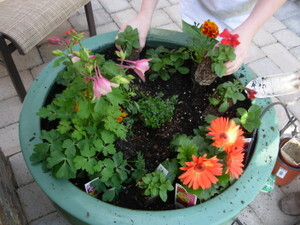 It was time to do some planting, so I got the kids involved. 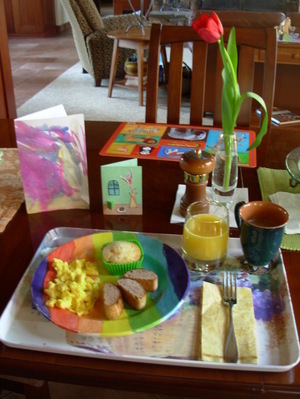 Finally, Happy Spring! 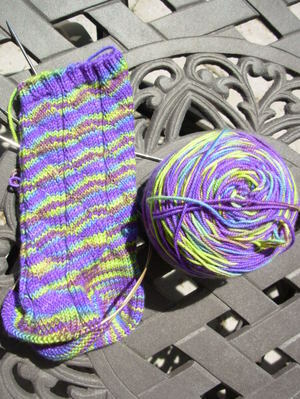 Here are two socks I started while at Camp Cockamamie. 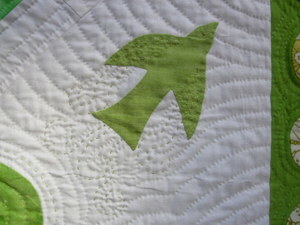 The first is Mystic Sea which is the pattern named after the whale watching boat. You can see the pattern a little more in this photo than the last time I showed it. The yarn is Socks that Rock, Lunasea. I think it's really beautiful. This pattern is really nice and I look forward to getting back to it. 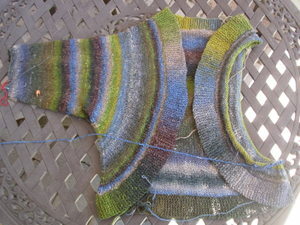 Right now I'm working on finishing these, my second pair of Marble Arches socks. 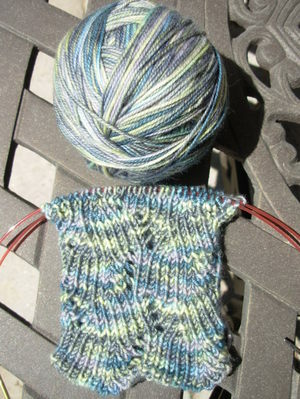 This is Socks that Rock Rare Gem, which is a one of a kind boo-boo or trial colorway. I like these a lot too, but it is rather bright! I've knit further on this since the photo and I'm now getting close to the toe on this first sock. This is my take along knitting so it's getting worked on quite a bit during the week. This weekend is sort of slow for us, but that's just fine with me. 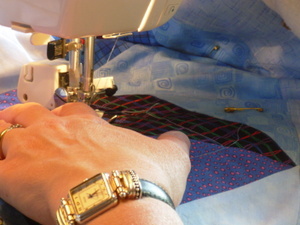 I'm taking the time to catch up on some sorely needed sewing. 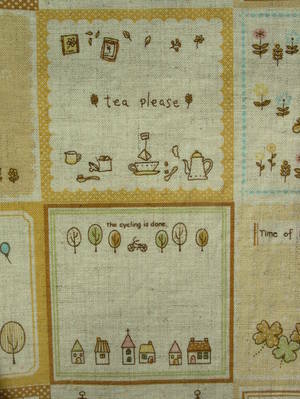 After a full day of sewing tomorrow, I hope I'll have something quilty to show for myself. Stay tuned! Here are a couple of other FO's from the past few weeks. One is the Chevron Scarf from Last Minute Knitted Gifts. I really love this scarf and the interplay of the two colors of Socks that Rock, mediumweight. This is Moss Agate and Monsoon. See more Chevron Scarf photos in this Flickr group. I still have about half a ball each of the two colors so I will probably make another scarf, but next time I'm thinking about doing a moebius style scarf sort of like the one below. This neckwarmer is made from my leftovers from these mitts. It's a handspun from Tanglewood Fibers and I just love it. I wanted to be sure it would be used in a special project. Since I knew I didn't have enough for a full scarf I combined it with another worsted weight wool that I will have to get the name of tomorrow. I alternated the two yarns every three rounds (3 rounds K, 3 rounds P). Because of the nature of the moebius, this means that you can see one yarn better on each half of each side. Click the photo to see this effect and to see the beautiful colors of the yarn. I can't seem to stop myself with these meobius scarves just yet. I just finished another one that will have to remain a mystery for now because it's a gift. I have at least three others in the works. These make wonderful gifts because they are such simple knitting but really are a big bang when gifted. "Wow! How did you make that???" Also, you can make a scarf such as this with 2-300 yards which is great for those special skeins you don't really know what else to do with. 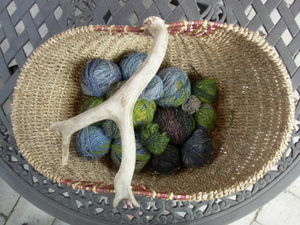 If you do happen to give it a try don't forget to post your photos to my new Magical Moebius Knitting Flickr group. 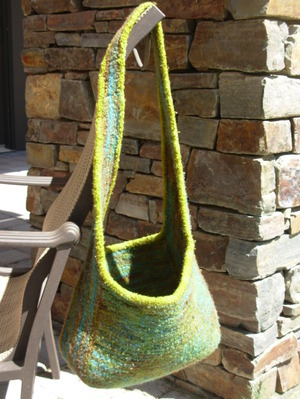 I bought the pattern and yarn for this bag at the Magical Moebius Weekend and started it the last night we were there. It is my new favorite bag and I'm loving it! As far as I know, Nancy's shop may be the only one carrying the pattern and it's not listed online that I can see, so if you are interested contact Nancy directly. It's a moebius design made with Cat's moebius cast on. The bag is widened by using short rows and lots of stitch markers. Nancy was so sweet when I was starting this and didn't have enough different types of stitch markers to use (you need a bunch of different ones to keep all the bag sections separate). She said, "wait a minute" and came back with a little pack of markers specially made for this pattern. She said I could have them for free as they were a prototype and she just knew they were meant for me! How sweet! I finished this one just in time for our homeschooling conference and wore it the whole time. I thought the wool might be too itchy on the hot days, but it never was. We'll see what it's like in the true summer time. The yarn is Fleece Artist Blue Face Leicester Aran which is simply yummy to knit with and felts beautifully. 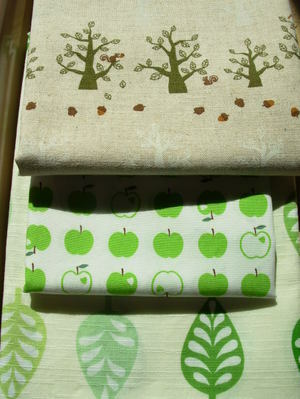 This colorway is called Woodland, though I saw another dyelot of this colorway that was quite different. This yarn comes in a huge skein and was supposed to be enough to finish the whole bag. I ran out half way through the I-cord bind off. This wasn't so bad though because I got some more of my favorite Manos del Uruguay green and used that for the bind off. I think the color complements the bag quite well. Also, the two yarns felted together beautifully which was lucky for me. Now I have some extra Manos, but that's no hardship! 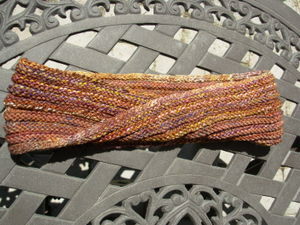 Oh, and while I'm thinking of it, I started a new flickr group called Magical Moebius Knitting. I'd love to have more moebius photos on there. Please only post moebius made with Cat's cast-on. More knitting to come soon and some quilting too, so don't despair all you quilters out there!